Definition of mentoring: what exactly is mentoring? Are buddy systems and employee mentoring programs the same? Why do organizations implement formal mentoring programs? How are informal and formal mentoring different? What do you mean by “chemistry” and “compatibility”? How does an organization know when it’s ready to implement a formal mentoring program? What does a Mentoring Program Manager do? How can we create a pilot mentoring program? How can you determine an organization’s need for mentoring? Are there different types of mentoring models in a structured program? What are they? What is the role of diversity in mentoring? What results can be achieved in a structured mentoring program? Why shouldn’t we create a program ourselves? What does an outside consulting firm offer a prospective client? Download our ebook Mentoring: A Business Strategy That Works for only $2.99. There are many other differences. 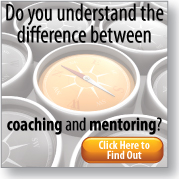 Download our free white paper on coaching vs. mentoring to learn more. Are buddy systems and mentoring programs the same? No. Buddy systems are initiated by organizations to help new employees adjust to jobs during their first few months of employment. Buddies are most often peers in the same department, who assist new employees for short periods of time and require no specialized training as a buddy. Mentoring is a more complex relationship and focuses on both short- and long-term professional development goals. Though a mentor may be an employee’s peer, most often a mentor is a person at least one level higher in the organization who is not within the mentoree’s direct supervisory line of management. Interest in mentoring has varied over time and has been affected by economic and social factors. Organizations recognize that workforce demographics have changed dramatically in recent years, as women and members of different minority groups have joined the workforce in greater numbers. In addition, technology has automated traditional employee functions and continues to affect on-the-job performance, altering the way people see themselves within the corporate structure. With these changes, organizations are finding it difficult to recruit and retain qualified personnel. As corporate downsizing continues, organizations are also experiencing a flattening of their organizations, challenging them to provide sufficient growth opportunities for employees. On the plus side, organizations find today’s employees exhibit a more flexible approach to work. On the minus side, employees may feel less loyalty to the organizations for which they work. 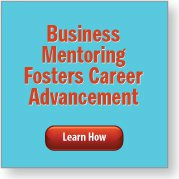 Interested in launching a formal mentoring program? Our e-mentoring software, MentoringComplete, can help. Learn more about MentoringComplete. Absolutely. Informal mentoring occurs all the time and is a powerful experience. The problem is that informal mentoring is often accessible only to a few employees and its benefits are limited only to those few who participate. Formal or structured mentoring takes mentoring to the next level and expands its usefulness and corporate value beyond that of a single mentor-mentoree pairing. Informal and formal mentoring are often confused, but they are very different in their approaches and outcomes. Organization and employee both benefit directly. "Chemistry" is an intense, very personal feeling – an initial connection or attraction between two individuals that may develop into a strong, emotional bond. Unstructured and unpredictable, it is the basis for an informal mentoring relationship. "Compatibility" occurs when individuals work together in harmony to achieve a common purpose. In formal mentoring, that means a more-seasoned person leading someone less experienced through a structured professional-development program in much the same way teachers facilitate learning. Why do organizations need a structured mentoring program? Aren’t managers already performing this role? While many managers demonstrate mentoring behavior on an informal basis, it is very different from having a structured mentoring program. There is a qualitative difference between a manager-employee relationship and a mentor-mentoree relationship. and recommends possible salary increases and promotions. Because managers hold significant power over employees’ work lives, most employees demonstrate only their strengths and hide their weaknesses in the work environment. about salary increases and promotions. This creates a safe learning environment, where the mentoree feels free to discuss issues openly and honestly, without worrying about negative consequences on the job. The roles of manager and mentor are fundamentally different. That’s why structured mentoring programs never pair mentors with their direct reports. Breaking down the "silo" mentality that hinders cooperation among company departments or divisions. Elevating knowledge transfer from just getting information and to retaining the practical experience and wisdom gained from long-term employees. Supporting the creation of a multicultural workforce by creating relationships among diverse employees and allowing equal access to mentoring. Creating a mentoring culture, which continuously promotes individual employee growth and development. Gains insights from the mentoree’s background and history that can be used in the mentor’s professional and personal development. Gains satisfaction in sharing expertise with others. Gains an ally in promoting the organization’s well-being. Learns more about other areas within the organization. Has a friendly ear with which to share frustrations as well as successes. In addition, there should be individuals within the higher ranks of the organization who will champion the mentoring initiative and help make it happen. Advocates may include the organization’s president, vice presidents and other influential executives. A Mentoring Program Manager (MPM) is also needed to coordinate the mentoring program. The MPM should be someone who is perceived as a facilitator, listener and coalition-builder – a person who is trusted. MPM is not a full-time position, so mentoring responsibilities must be balanced with the MPM’s other duties. Typically, such a person works in a Human Resources, Organizational Development, Training or Diversity Department. 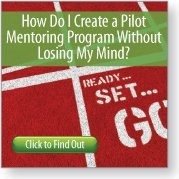 Learn how to get a pilot mentoring program off the ground in our free white paper. Coordinating the mentoring process within the organization means working with a Management Mentors consultant, as well as fellow employees, to design and implement a mentoring initiative that fits the organization’s culture. The initiative forms the basis for ongoing mentoring. During the pilot, a Mentoring Program Manager (MPM) typically works with 20 to 30 individuals (10 to 15 pairs). The manager contacts them on a regular basis, making certain the relationships are going well and that the mentoring program is achieving its goals. The MPM offers each pair whatever resources may be needed. The MPM also becomes the organization’s internal mentoring expert, serving as a resource for various departments and divisions that have an interest in pursuing mentoring. The amount of time this take varies. Normally, a MPM spends one to four hours per week coordinating the project, depending on how often the mentor-mentoree pairs meet. 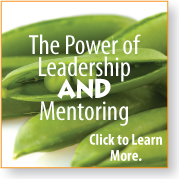 TRAINING: We have an online certification program for mentoring program managers. Take it at your convenience from the comfort of your home or office. The Mentoring Program Manager forms a task force of 6-8 people. Members of the task force should represent a cross-section of the organization, including potential mentors and mentorees, supervisory personnel and any stakeholders who can bring value to the process. For example, a representative from Human Resources might help tie department goals with the goals of the mentoring program. Want to learn more? Download our FREE white paper on how to create a pilot mentoring program. need for mentoring is greatest, and whether there is sufficient support for a mentoring program. depends on what steps an organization has already taken as well as what resources are available. Not sure what direction to go in? We can help. Contact Management Mentors now for a free consultation. The most common mentoring model, one-on-one mentoring matches one mentor with one mentoree. Most people prefer this model because it allows both mentor and mentoree to develop a personal relationship and provides individual support for the mentoree. Availability of mentors is the only limitation. Resource-based mentoring offers some of the same features as one-on-one mentoring. The main difference is that mentors and mentorees are not interviewed and matched by a Mentoring Program Manager. Instead, mentors agree to add their names to a list of available mentors from which a mentoree can choose. It is up to the mentoree to initiate the process by asking one of the volunteer mentors for assistance. This model typically has limited support within the organization and may result in mismatched mentor-mentoree pairing. Group mentoring requires a mentor to work with 4-6 mentorees at one time. The group meets once or twice a month to discuss various topics. Combining senior and peer mentoring, the mentor and the peers help one another learn and develop appropriate skills and knowledge. Group mentoring is limited by the difficulty of regularly scheduling meetings for the entire group. It also lacks the personal relationship that most people prefer in mentoring. For this reason, it is often combined with the one-on-one model. For example, some organizations provide each mentoree with a specific mentor. In addition, the organization offers periodic meetings in which a senior executive meets with all of the mentors and mentorees, who then share their knowledge and expertise. This model is tied directly to a training program. A mentor is assigned to a mentoree to help that person develop the specific skills being taught in the program. Training-based mentoring is limited, because it focuses on the subject at hand and doesn’t help the mentoree develop a broader skill set. This top-down model may be the most effective way to create a mentoring culture and cultivate skills and knowledge throughout an organization. It is also an effective succession-planning tool, because it prevents the knowledge "brain drain" that would otherwise take place when senior management retires. For further information, click here. Mentoring can be of great value to women and people of color. These are the employees who have often been disenfranchised within organizations and have not been “chosen” by informal mentors. However, if mentoring is to be successful as a tool for empowering employees, it needs to be truly diverse – representing everyone within the organization and not just women and people of color. By including the broadest spectrum of people, mentoring offers everyone the opportunity to grow professionally and personally without regard to gender or race. A successful mentoring program needs to balance the need for inclusion with the need for fair representation. For many years, some organizations thought of mentoring only as a tool to help women and people of color. Viewed inappropriately as a remedial program, mentoring lacked widespread support within most organizations. These mentoring programs did not provide mentorees with the assistance they really needed. Good intentions gone astray resulted in a misapplication of mentoring. Diversity is equally important when choosing mentors within organizations. Because many mentoring programs are geared to management levels, today’s mentor population still tends to be made up of white males. As organizations seek to devise mentoring programs, they need to include mentors who are both non-white and non-male. Using the resource-based or group-based models, tied to the one-on-one mentoring model, can help diversify the mentor population. For example, one of the mentoring goals might be to learn how to navigate effectively through the organization’s culture. Using the group model, an organization might have a panel of diverse employees meeting with the entire mentor-mentoree population to share how they have successfully navigated that culture. Though a great deal has been written about mentoring, there is little statistical data supporting its value. Much of the published information available is based on theory alone. Because mentoring is about human relationships, it is more difficult to quantify scientifically. Using interviews and questionnaires, Management Mentors has evaluated mentoring programs implemented by client companies. The results consistently demonstrate that well-designed programs lead to the acquisition of knowledge and expertise within a trusting and supportive mentoring relationship. Learn more about specific results by reading some of our client case studies and client testimonials. There are myriad examples of mentoring programs that failed because organizations mistakenly believed they fully understood mentoring. Rather than create a successful program, they negatively impacted the careers of both mentors and mentorees. Typically, such programs have put people together without clear guidelines, offered no training about mentoring relationships, lacked internal support, paired employees with the bosses of the employees’ immediate supervisors, and violated other fundamentals of mentoring. The amount of outside expertise needed to establish a mentoring program varies from organization to organization. Most organizations have found that using a consultant to set up a pilot program has made the difference between success and failure. Higher success rate - previous mentoring expertise helps organizations avoid pitfalls that have derailed many mentoring programs. Would you like to learn more about our services? Call us at 617-789-4622 617-789-4622 or contact us to see how you can achieve desired business results through a well-designed mentoring program.